Because the cakes are domed with whipped cream, placing cakes on separated plates like this is a way to serve a Princess Cake for a wedding cake. Otherwise, ice the filled cakes with buttercream before covering with marzipan. I was very fortunate to have gone to the California Culinary Academy beginning in January of 1979 which meant, I was the second class formed in that school. Bo Friberg was the pastry chef instructor at the time. Bo was a Swedish pastry chef who was very well trained in Sweden. He was also the pastry chef at Tiburon’s well loved bakery cafe, Sweden House. His signature cake in my estimation was Princess Cake which is a light delicately flavored cake covered in marzipan. This was my birthday cake every year for I don’t know how many years. It was my favorite cake growing up. When I went to New York City soon after beginning my baking career, I made Swedish Princess Cake for a job application at William Poll Gourmet Luxuries and Catering which used to be located on Lexington Ave. and 72nd Street. I got the job. Princess Cake has always been a truly beloved cake. Break up the almond paste into small pieces and place it in the bowl of a heavy duty mixer. It is advisable to add the confectioner’s sugar a little at a time and using a paddle mix the almond paste and confectioners’ sugar until dry crumbs the size of peas is achieved. Add the corn syrup and the vanilla and the rum if you like. Rum can be omitted but it is delicious. Make sure the paste is soft and pliable..wrap and set aside for covering the cake. You can refrigerate marzipan for up to a month. You can use the marzipan immediately. With whip attachments, place the egg whites and egg yolks in separate mixing bowls. In the bowl with the yolks, add the oil, water and vanilla. Whip on slow speed until frothy. Begin whipping the egg whites on moderately high speed. When the whites are at the soft peak stage add 2/3 of the sugar and continue to whip to a meringue..
Sift together the flour, baking powder, salt and 1/3 of the sugar or 5 ounces and add the dry all at once to the egg yolk mixture and whip on medium speed to incorporate the ingredients well. Scrape down the bowl and continue to whip for 1 minute on moderately high speed. Fold the whites into the yolk mixture and and make sure the whites are well incorporated. Bake in the pans for about 20 minutes, give or take a few. The nice thing about making strawberry preserves or any preserves for Swedish princess cake is their freshness and the ability to add lemon for brightness. You can use commercial preserves of your choice. Raspberry preserves are often used but strawberry has always been a favorite as well. Cook the strawberries and sugar over medium high heat until the juices run and the mixture begins to boil. Add the rind of the lemon and the lemon juice and bring to a boil. When the mixture comes to a rolling boil add the packet of pectin and boil for exactly 1 minute and remove from heat. Pour into a clean container and cool for a day. Preserves should be used immediately. For wedding cake making, it is advisable to make preserves just for the cake that is being filled with them. It is best not to use homemade canned preserves for wedding cakes. Use commercially made preserves for safety reasons. In the bowl of a heavy duty mixer, using a paddle, beat the yolks and the whole egg until they begin to lighten. Add the granulated sugar to the egg mixture in a thin stream. Allow to beat until the egg/sugar mixture is light and increased in volume. Bring the milk and the heavy cream to a boil in a saucepan. While the milk and heavy cream are warming up on the stove, add the corn starch and the all purpose flour to the egg mixture and beat well to thicken. After the milk and cream show the first signs of bubbles, remove from the stove, stop the mixer and pour in a small amount of the hot milk/cream to temper the eggs. You never want to shock eggs with hot liquids..this process has to happen slowly. Begin to blend slowly and then pour mixture back into the saucepan and start to warm the mixture up on the stove once again but use a whisk to keep the mixture moving as it heats up because you don’t want lumps to form. The process of heating this custard with the corn starch and the flour is a process that bursts the starch in both ingredients and that is how the custard is thickened. When a bubble is reached and the temperature is about 160 degrees F or a bit more, remove from the stove and add the vanilla extract. Pour the contents of the saucepan into a flat shallow container and place plastic directly on the surface of the custard to prevent a skin from forming..chill well. Whip the 1 cup of heavy cream and fold into the cooled custard to lighten it up. Whip the heavy cream to soft peaks and add the sugar. Whip to stiff peaks and chill to reserve. Make the marzipan and the strawberry preserves. Prepare the layers of chiffon cake by removing the bake layer. On the bottom layer of cake, spread a generous amount of strawberry preserves. Place another layer of cake on the preserves and brush with simple syrup. Cover the second layer with a generous amount of French Vanilla Cream. Place another layer of cake on the French Vanilla Cream and brush with simple syrup. Cover the whole cake with the chilled whipped cream and dome in the center so that when you cover the cake with marzipan it will have a rounded top. Roll out the marzipan and drape over the cake. Marzipan can benefit from being rolled out over a thin dusting of confectioners’ sugar. Decorate with royal icing piped in any design you wish or just decorate with a simple pink marzipan rose which is the traditional decoration. 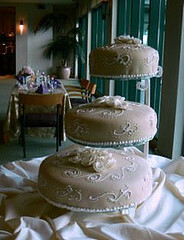 These cakes are often tinted green, however for a wedding cake, the natural color of the marzipan is beautiful. You can color the marzipan any color you wish but keep the colors light and pale..dark marzipan is unappetizing.